Living without a car requires extra planning. I know I still have my truck, but I haven’t driven it in quite a while. I needed to get pet supplies today. That means towing the trailer to work and stopping by Feeder’s Supply on the way home. I don’t generally tow the trailer with the single-speed, but the LHT was partially disassembled last night. I hadn’t planned. I put the LHT back together last night, and did a rush job of getting the trailer ready this morning. The morning commute was uneventful. Parking the bike & trailer at work is a little troublesome. It still goes in my office, but I have to step over the trailer when getting up or down. I may disconnect it and put it somewhere else next time. 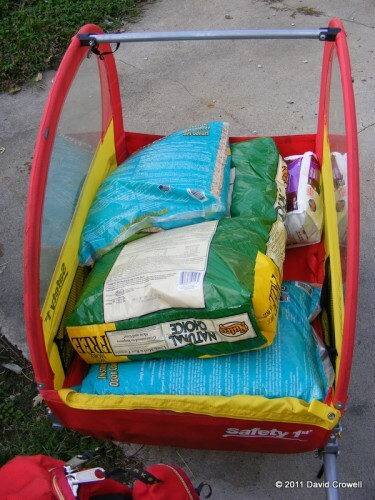 After work I bought a 38.5lb back of dog food, two 20lb bags of cat litter, and a 10lb bag of cat food. That totals 88.5lbs of stuff. With the weight of the trailer, I was towing over 100lbs. That doesn’t count the commuting load in the pannier and trunk bag. The ride home was slow and easy on side roads. Even the slightest hill meant using a low gear and going slow. 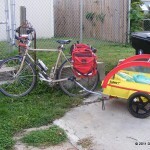 Buying this cheap, used trailer has greatly increased my carrying capacity. 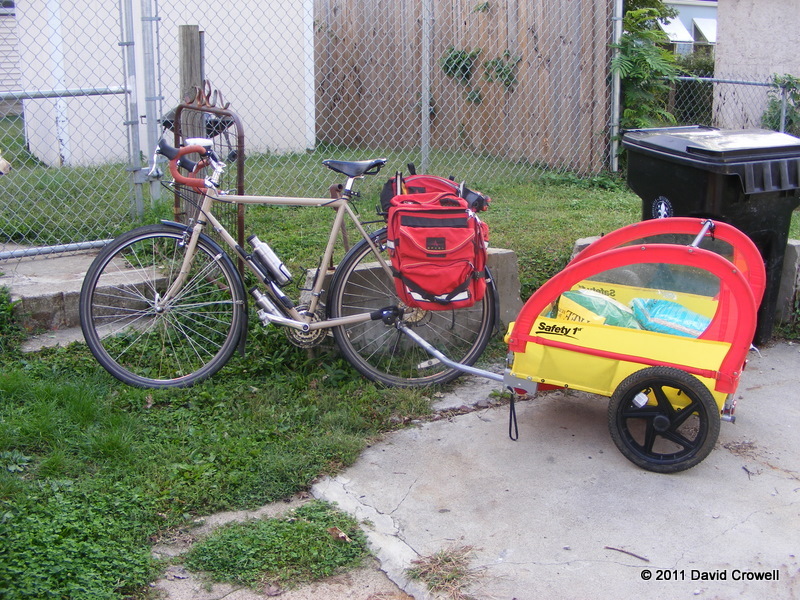 I don’t think it’s ideal, as I’d rather use a Big Dummy, but this was much cheaper. Today was the last day of my four-day weekend. I didn’t sleep in, I was up puttering around the house. I did some useful things, and wasted some time. I wasn’t feeling energetic enough to go out on an epic ride. I was running low on coffee. I normally buy my coffee at Vint on Main Street because it’s right across the street from work. I wasn’t working today, but I still needed coffee for tomorrow morning. It was pleasant riding my commute route when it wasn’t rush hour. I bought a pound of coffee and drank a cup while I was there. I then headed eastward and turned south on Baxter Ave. The LMPD have been known to be (mostly) bicycle friendly. Some of them even do bicycle patrols. The Jefferson County Sheriff Department… not so much. One local bike advocate was ticketed by the sheriff’s office for not riding in a bike lane. Kentucky does have an oddly-worded law requiring it “if practical”. After much public outcry, the ticket was tossed. Anyway, I was on Baxter Ave, which does not have a bike lane. It has “flexible lanes”. There are a total of four lanes. The outer two lanes are for parking most times, but that changes between 4:00pm and 6:00pm, and no parking is allowed. So, it was 4:05 and there were no cars in the right lane. I took the right lane (it is narrow) and was moving along about 17mph. I sheriff department SUV was behind me. Rather than pass in the other lane, he honked his “buzz” horn. I don’t know what they call it, but the sound makes it clear it’s an emergency vehicle. He did not turn on any lights, so I ignored it. After three more buzz-honks, I stopped in the middle of the lane and asked him if he was pulling me over. He made several confusing hand gestures. I repeated myself. He made a clear hand gesture to get moving, so I did, still taking the right lane. A few blocks up, he turned right while I continued straight. I spent the next several minutes being amused about the sheriff. He’s probably used to harassing cyclists, and they do what he says, whether they were breaking the law or not. The incident with the local advocate probably lead to an internal memo being passed around, and my refusal to squeeze to the right in a narrow lane reminded him of it. I continued on to Bardstown Rd and stopped at Cumberland. I’m not supposed to drink beer or eat “heavy” food. So I had only one beer, several glasses of water, and a salad. Tim and I communicated via text, and I rode to meet him during near River Rd for a quick ride. I rode a very urban, very heavy traffic route getting there. It’s not something I do in a group, but there are days, and today was one of them, where I feel strong enough to mostly keep up with traffic. I met up with Tim and we rode through Indian Hills, St Matthews, Seneca Park, and Cherokee Park. His original plan was to hit the Beargrass Creek Trail, but last night’s deluge would mean mud, so we buzzed along Lexington Rd instead. We continued out Mellwood Ave back to the start location. It was about 13 miles in about an hour. There were many cyclists out for the evening. It was a bit cool, but pleasant. Tim wasn’t feeling well, he wrote more about that here. We went our separate ways, and I headed back down Mellwood Ave into downtown before heading south on Third St. I ride Third St as part of my commute home most every day. I pass Third Avenue Cafe most every day, but I can’t remember ever going there. So, I stopped and locked my bike up outside. I had another salad, and another beer. I also had more water. Salad doesn’t do much for energy when cycling. I arrived home with 33.2 miles for the day. Nothing epic, just a mostly lazy, pleasant day. Due to the moisture and proximity to the river the gnats and other small bugs were horrible. I ate several. Tim had one in his eye. I looked like a poppy-seed bagel by the time I stopped at Third Avenue Cafe. Because I had originally just planned to ride 3.5 miles to buy a bag of coffee then ride home, I was wearing jeans and a t-shirt (and a helmet). Other than wishing for long sleeves as it got cooler, I was perfectly comfortable during the ride. Another 20 miles and I might have been wishing for a chamois. I felt bad for Tim. He was obviously not feeling well, but I was feeling quite strong. It’s good to get out and ride when you’re having a bad day though. I think the ride did him some good. Look what greeted me in the shower this morning! 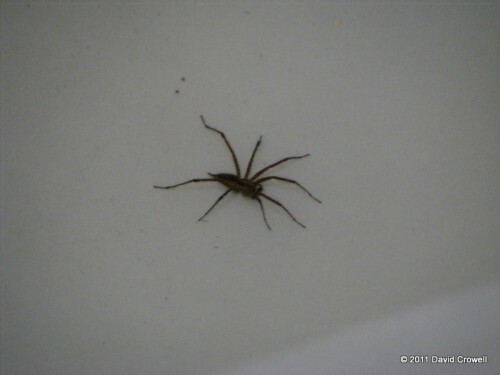 I have neutralized the enemy (squished him and flushed him down the toilet). He was about three inches from tip of front legs to end of rear legs. Gah! 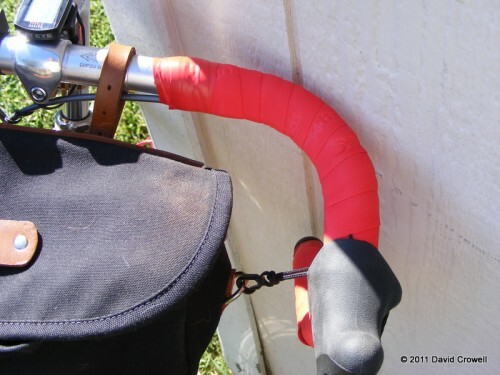 Sarah guessed in a comment to my previous post that the handlebar tape was pink. Give her a cookie! Pink is like red, so that’s what I chose. It’s a cork-gel tape, not cloth, so no shellac. It’ll be just pink. 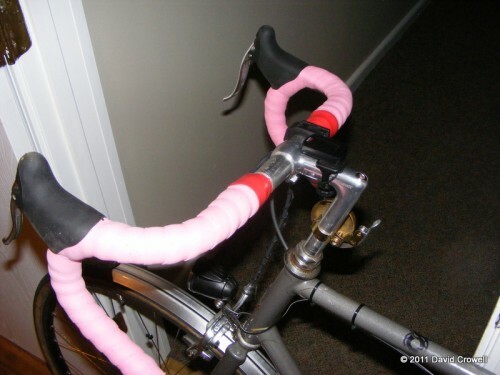 I’m man enough to ride with pink tape, at least until it becomes grungy-pink, then I’ll replace it with something different. Before putting the new bar tape on, I re-positioned the brake levers and replaced the cables and cable housing. It’s a far better job than I did last time, but it’s not perfect. I also like this bar-tape better than what I used before… I don’t actually remember the brand of the last stuff, but this is Planet Bike bar tape. Not only was it easier to wrap, but it was several dollars cheaper. 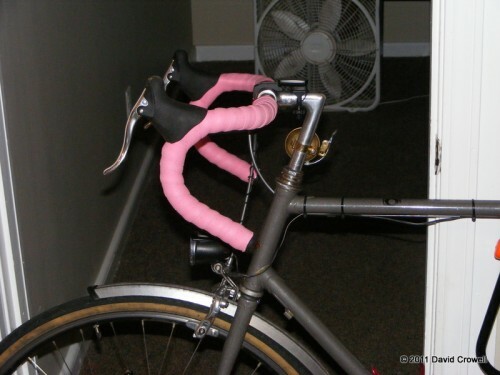 Posted on September 25, 2011 Categories Bikes, Pictures5 Comments on Pink! Since I’m stuck in the hospital and have a laptop, I’ve been browsing. I have some gravel rides planned for this year yet, and my LHT will have to be that machine once I remove some unnecessary equipment and put on bigger tires. That’s not idea. 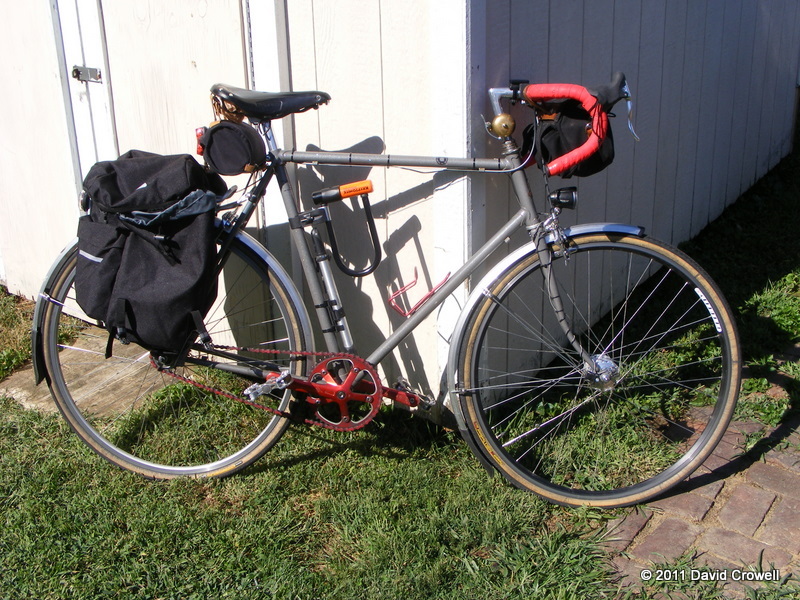 My LHT should remain my touring bike. So, I need a gravel bike. I have several others I need too, but today I’m thinking about gravel. I don’t think this will happen in the next 16 months, but it’s on my wish list. UPDATE: The nurse came in, and told me I can go home today. She removed the IV, and is working to discharge me. Yay! V-Brakes, center-pull calipers, side-pull calipers, cantilevers, disc, whatever. No bicycle brake works as well as a decent automobile brake. Then again, I don’t want 100lbs worth of brake on my bike. 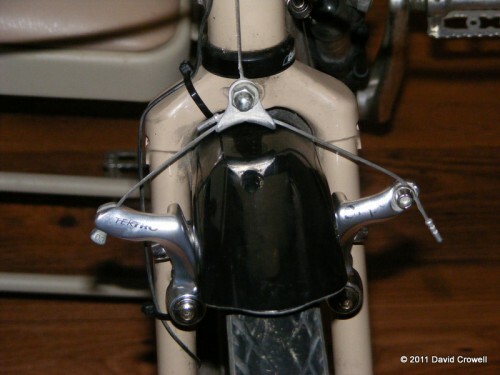 The cantilever brakes on my LHT (cantis for short) aren’t great. I changed brake pads and adjusted toe-in a few months ago, and I have slightly more stopping power, but the front brakes squeal. The left brake arm on the front had also not been pulling away from the wheel completely when releasing the brake. I’ll be riding 100 miles on that bike next Sunday. I don’t want a dragging brake the whole time. I pulled the front brakes off the bike and cleaned everything today. I re-lubed the necessary parts and reinstalled, paying careful attention to what hole the return spring sits into. The return spring was the issue with the left brake arm. The brakes work much better. They’re adjusted better for more stopping power. The brake arm returns away from the rim when I release the lever. But, the damn things still squeal. Gah! Tim called it “furly”, and it was. I got up at 4:00am, made breakfast and coffee, showered and was out the door at 5:30 to meet Tim and Patrick for a 50 or so mile road ride. I was concerned about the weather. It was quite cool, but not quite cool enough for long-sleeves. There was a chance of rain, which would make it cooler. I wore shorts and short sleeves and brought a long-sleeve compression shirt with me. Although it did start raining, I never felt cold enough to change. We met near the intersection of Bardstown Rd and Douglass Blvd, known as “The Loop”. We had planned to meet at 6:00, but were underway by 5:45. Tim planned an urban route that would still get some climbing in. We headed west, then south and looped around in Iroquois Park. We stopped for bathroom/water break before leaving the park. I ate a peanut butter sandwich while waiting. We headed back north, through Old Louisville and downtown. We shared River Rd with runners (there was a race of some sort going on). We stayed out of the way. We cut up through the Mockingbird Valley area, then over to Indian Hills where we did some more looping, just to ride the hills more than once. Then back to River Rd and out to Wolf Pen Branch and Barbour Ln. We took some neighborhood streets and were near Patrick’s house, so he headed home to take care of family duties. Tim and I headed west on Westport and into St. Matthews where we stopped at a bakery for some much needed carbs. We continued through Seneca Park and to The Loop and had breakfast and Twig & Leaf. There was an LBC group having breakfast there because they cancelled their ride due to rain. Tim and discussed riding a little extra to get 62 miles (100 kilometers) to have a metric century. We each headed home from there. I took a roundabout way to Sunergos Coffee and enjoyed a good cup. I then took a wandering route home. My bike computer said 62.3 miles, which is just over 100 km. It wasn’t even noon yet. That’s a pretty good start for the day. Tim posted his Fall plans. Sunday 9/25- I’ll be driving up to Brown Country, finally, for a half-day of trail riding up there with Apertome and Dave G. EVERYBODY talks about how fun the BC trails are. Also, mostly everybody talks about them in terms of good flow instead of gnarly technical challenges. I like that. Sat/Sun 10/22-3- At least 3 of us will be going to Red River Gorge for a 1-night bikes+camp weekend. We’ll drive down early Sat and take in 100K of E.KY/DanielBooneNF mixed-terrain goodness. After a good camp we’ll do the 28m RRGorge Loop, road in nature this time, before heading home at lunch Sunday. Lastly the posse is all planning on taking on the Gravel Grovel, Saturday 11/26. That’s another 100k worth of pure gravel, double track and some singletrack. Given it’s status as a “race”, we/I’ll need to be in reasonable shape to not miss any cut-offs. The first one, 9/25, I won’t be taking part in. Instead, I’ll be in Three Oaks Michigan for the Apple Cider Century. Yep, one week from tomorrow I’ll be riding a century. I used to live in Niles Michigan, about 20 miles away, and it’ll be nice to get up there again. I’m actually taking a four-day weekend, and hope to get other riding in besides the century. I also hope to visit some old friends. Oh, and I’ll be camping due to lack of money for hotel rooms. Brrr…. I am planning on joining everyone for the other two events listed. The Red River Gorge camping trip will be similar to last year’s Big South Fork adventure. The Gravel Grovel, being a race, is something totally new to me. I’m not sure what to make of it, but it’ll be fun no matter what.